Sunita Rai is a WordPress lover, digital marketing, SEO, and blogging enthusiast. She writes articles on different websites and loves media marketing. She writes for several websites like MonsterInsights, IsItWP, and more. It’s been around 4 years since she started her WordPress journey. I’m a WordPress enthusiast who loves it, works on it, and wants to help beginners become successful in it. From the day I discovered this platform, I’ve been writing on and about it. I’ve worked with Nepal’s renowned WordPress companies Access Keys and ThemeGrill. I’m currently writing for the most user-friendly Google Analytics WordPress plugin, MonsterInsights and the largest free WordPress resource website, WPBeginner. I’m currently based in Kathmandu which has the largest WordPress community in Nepal. I believe WordPress Kathmandu is a very active and strong community of WordPress professionals who are committed to making more contribution back to the community. The community here has provided me with a lot of support as well as inspiration. I learned about WordPress from my uncle and aunt and started my first free blog in 2015. The same year, I joined Access Keys as a content writer and that’s how I started my career officially in WordPress. Yes, there were. I had taken the WordPress content writing job but I wasn’t well experienced with WordPress. Initially, I was learning rather than doing my job. It was ‘learn and write’ phase for me. I used to spend a lot of my work time to do research, test, and understand. However, my self-research wasn’t always enough to understand things. So, I used to ask anything to the senior developers in the team, and our employer, the CEO of Access Keys also guided me a lot. Yet, the process of learning hasn’t come to an end and will never end. I used to consult a lot to my employers and colleagues at ThemeGrill as well. And, it’s still the same with my present workplace, Awesome Motive. I’m learning each and every day. Yes! I wanted to meet WordPress enthusiasts just like me in Biratnagar. The excitement doubled after actually seeing the crowd, the young people with a lot of energy and enthusiasm really moved me. Our talk was a panel discussion on ‘Girls in WordPress – Story and Experiences’. I think the attendees could take ‘hope’ from our talk. We shared our experiences working with WordPress and how it has empowered us in life. We also discussed what career opportunities are there in WordPress for fresh graduates. The WordPress community here is awesome. It’s growing both in numbers and its contribution. Newer communities are being formed in different cities, regular meetups, and events like WordCamps are being organized. We’re moving ahead! The most fascinating aspect of WordCamps is the platform they provide to meet and greet the WordPress people in real. We often communicate via online however we miss out something in those communications. WordCamps give us the chance to communicate in the real sense. Besides, I love the food we get in WordCamps. I think it’s different from other WordCamps from only one aspect, the massive participation of the young IT students. The other WordCamps I’ve been to had professionals mostly, but most of the participants in Biratnagar are newbies. That’s because WordPress community is just starting out in Biratnagar and there aren’t many WordPress companies like in Kathmandu or elsewhere. As a writer, the best way I can contribute to the community is by writing articles which are actually useful. And, I’ve been doing that since the beginning. Besides, I’ve talked at WordCamp Kathmandu 2016 on ‘SEO Copywriting’, and shared my experiences at WordCamp Biratnagar to inspire beginners. First, I heartily welcome them and congratulate them on choosing the right platform. Then, I would suggest them to reach out to people for any help they need because I believe our community is very supportive. If you look at the numbers, it’s very low compared to male participation but I see a lot of hope ahead of us. WordPress gives a truly woman-friendly job opportunity because you can write a blog, design a webpage, or write code right from your living room when you’re not able to travel due to period cramps. If your family isn’t supporting you to work outside in the late hours, then, you can work right from your home. Yet, you’ll need the support of your employers and your family. If you’re sincere to your work, your employers will definitely support you. My employers have always supported me. For more creative people, it’s liberating that you can start your own business easily with WordPress. You don’t need muscles to start your business. You can become successful just being who you are, a female. There’re many, however, the most useful one is WPBeginner. I took a lot of help from this resource website when I was starting out. I used to take a lot of writing inspiration from it. Nowadays I write for it but I learn more than that. The other websites I take inspiration from are AccessPress Themes, ThemeGrill, CodeinWP, DevotePress, Backlinko, and more. I read, watch movies, and travel. I’m a great food lover, so I sometimes cook watching food recipes on YouTube. Gutenberg editor seems really interesting that you can create content in WordPress a lot easier than before. The Gutenberg blocks make it really easy to create a media-rich and visually impressive pages in WordPress. For me, it’s indeed a great innovation. 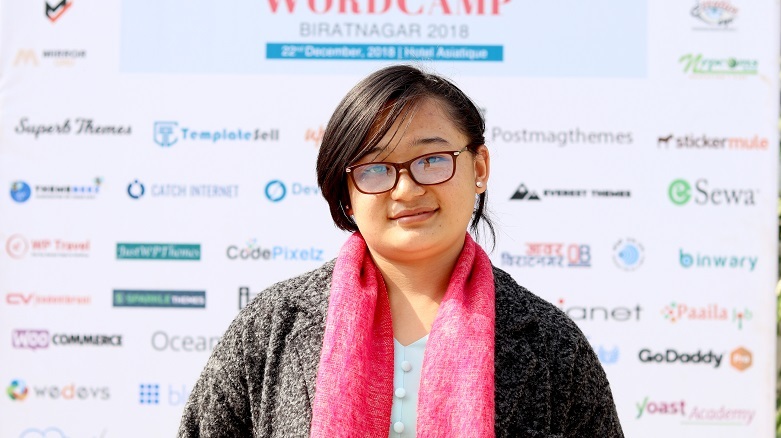 Sunita Rai at WordCamp Biratnagar 2018. Want to know more about Sunita Rai? Find her on Facebook or Twitter.